Start by grating 1 tablespoon blood orange peel and set aside. Squeeze juice from all of the oranges. Strain and discard pulp. In a small saucepan, combine the sugar, orange juice and peel. Cook and stir over medium heat until sugar is dissolved. Set aside to cool. 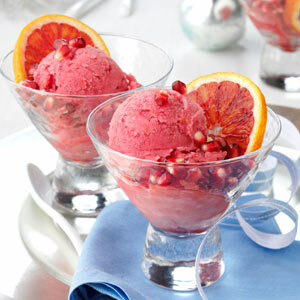 In a large bowl, combine the orange juice mixture, pomegranate juice and orange liqueur. Pour the mixture onto a cookie sheet and freeze until set. Break it up and blend in the food processor until smooth. Freeze and blend again just before serving for an ultra smooth consistency. Spoon into dessert dishes. Garnish with orange slices and pomegranate seeds.